Posted in Book Reviews, Contests, YA Fiction - fantasy/sci-fi	by Cait H.
The coin changed Ephraim’s life. But how can he change it back? Among his dead double’s belongings, Ephraim finds a strange coin – a coin that grants wishes when he flips it. With a flick of his thumb, he can turn his alcoholic mother into a model parent and catch the eye of the girl he’s liked since second grade. But the coin doesn’t always change things for the better. And a bad flip can destroy other people’s lives as easily as it rebuilds his own. The coin could give Ephraim everything he’s ever wanted – if he learns to control its power before his luck runs out. 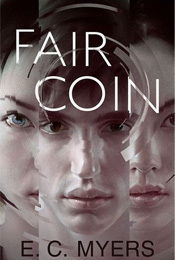 Fair Coin by E. C. Myers is a novel with a beautifully unique concept and execution of the idea. An at-first seemingly simple premise (magic coin!) becomes increasingly complex and so much more than it appears. The world building in Fair Coin is interesting in that E. C. Myers takes the world we know, and with each wish gets to change it slightly. At first the differences are small, hardly noticeable. But when Ephraim’s wishes get larger and he starts bringing friends along, the world as he knows it begins to change in larger, more obvious ways until he experiences everything from a dystopian like world, to an untouched paradise. The descriptions of the settings, people and emotions are very vivid and draw you into the story completely. Ephraim is an engaging and intriguing main character. He’s got the best of intentions, but starts off fairly selfish and uses the coin for his own gain. I give him props for trying to set things right once he figures out what’s really going on, even if it will mean he’s screwed over. Ephraim’s a nice guy, who’s all teenager. Nathan, on the hand, is rotten. Well, most of the time. It’s hard to explain when I don’t want to give away any spoilers. Just know that it’s fine to dislike Nathan – he’s written that way. Hardcover provided by Prometheus Books in exchange for my honest review. Thank you! I have one copy of Fair Coin to give away to one lucky reader from Canada or the US. Just fill out the form to enter. Ends August 17, 2012 at 11:59pm EST. 13 years or older to enter. Duplicates will be disqualified.